On one of my calls to my mama earlier during the week. She answered the phone singing to me, "Baby it's cold outside." Then she chuckled and asked how were we getting along with the cold weather. Well we are getting along. It's to be expected for the Chicagoland area. It's the coldest in January and February. But tomorrow we will get a heat wave, high in the 20's. By the weekend it will be about 40 degrees. I'm glad we are getting close to tolerable temps. Living in the mid-west all of my life, I know what to expect during the months of January and February. So for the month of January, my goal was to concentrate on making some separates to beef up my winter gear. 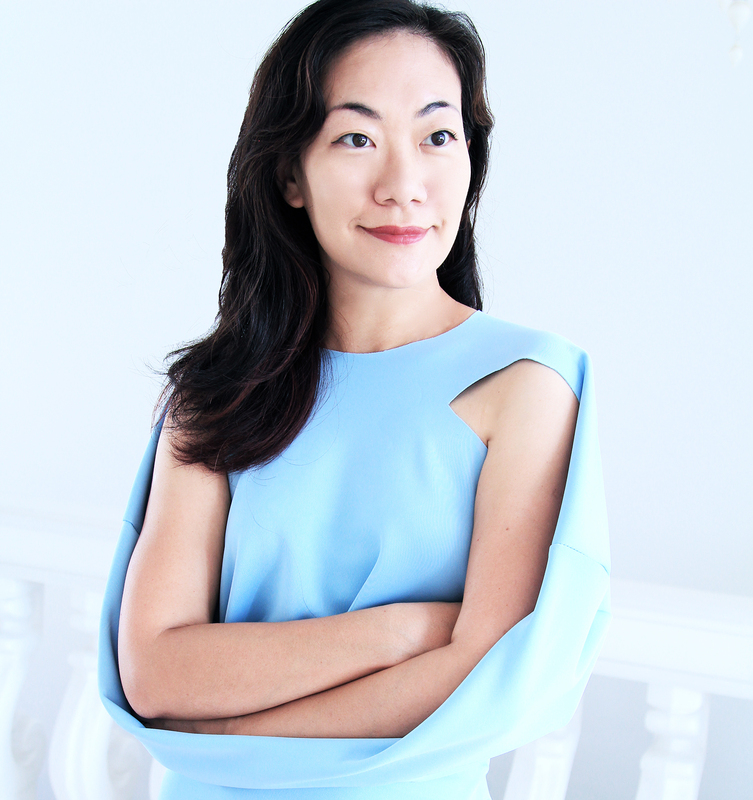 Sure I have some turtlenecks and warm pants ready in my closet, but many are worn and need to be replaced. 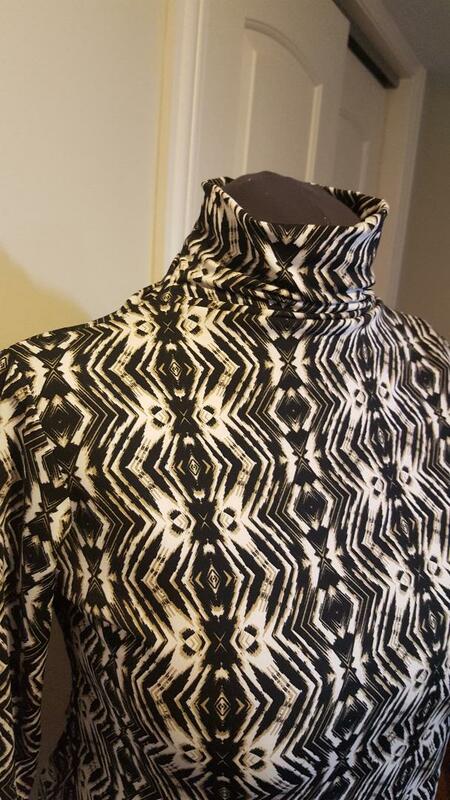 So last week, I make this cute little funnel neck top, pattern designed by Christine Jonson. 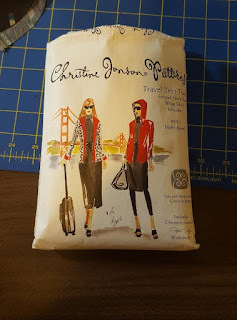 I bought all three of her Travel Trio patterns way back in 2011 when Rhonda created the Travel Trio Challenge for the Haute Couture Club 2011-2012 Fashion Show. I only made the Travel Trio One. This year I'm revisiting the Trio patterns to enhance my wardrobe. They are great basics. Funnel Neck top- close-fitting top with 3/4 length sleeves (with sleeve band) and funnel neck. Wrap Skirt- semi-fitted skirt with self-fabric ties that wrap around the back and tie in the front skirt may be made reversible. Hoodie- Hooded, loose-fitting jacket with long sleeves. Jacket is fastened at top with button and self-fabric loop. Jack may be made reversible. My Fabric is from FabricMart Fabrics. It's a jersey poly/cotton knit with 30% 4-way stretch and great recovery. Love it. I still have about 2.5 yards left to make something else. There are only three pattern pieces for the funnel neck top: front/back, sleeve and sleeve band. I didn't like the idea of using the one pattern for the front and back. Because my front and back are different shapes and sizes. 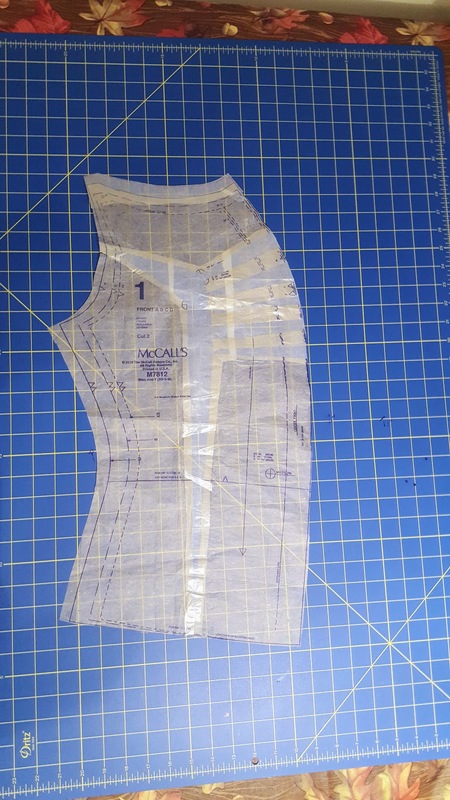 So I traced off two copies of the front/back pattern and adjusted each for my body shape and measurements. For the front, I wanted to test to see if I could get away again without making a bust dart. So I adjusted the curve of the lower armscye and side above and at the bust area and tapered back to the size 14. For the back I created a center back seam and made a swayback adjustments and adjusted the curve of the mid and lower armscye. The sleeve doesn't have notched for the front and back. I didn't like that either. So I added them. I think the shape of the front arm and back arm are different. So for the back I added just a little more for the mid and lower armhole area. The sleeve cap did not have the excessive amount of ease as the big four commercial patterns, which was a plus. And the shoulder seam wasn't an inch too long either. Two pluses. Once I made my adjustments and cut out my funnel top, it took about 1.5 hours to make. Super easy and all sewists can make it. I really like how this funnel neck top turned out. It's great for the winter; it keeps your neck and chest nice and warm. Will I make it again. You bet I will. One of my goals this year is to look at ways to maximize the use of my patterns. With this basic funnel neck top I could change the sleeve and/or make it into a simple knit dress. More later on using this simple, but versatile pattern. Today is the coolest day of the year, -11 degrees but it feels like -48 degrees. Yikes!!! Anyway, enough on the weather forecast. It's time for another installment of Notes on a Pattern. This time I'm reviewing McCall's 7812. The reason why I chose to do a "Notes" blog is because this pattern definitely requires some changes in order to get a good fit for women with a similar body shape as mine. And I thought it would be worthwhile to talk a little bit about the FBA and the neckline. I made a FBA and rotated the bust dart into the center ruching. I simply made the four basic slashes to the pattern and instead of creating a bust dart, I closed that slash and rotated it to the center. The process is very similar to my tutorial from 2014. Instead of rotating to the shoulder pleats, rotate to the center ruching distributing the access in the bust area. See image below. My first two tops do look like the drawing. The first challenge was to get it to fit nicely in the bust area without making the ruching look like draping. For starters I made the FBA half of what I'd normally do for a woven top. I also made the swayback and prominent shoulder blade adjustments. 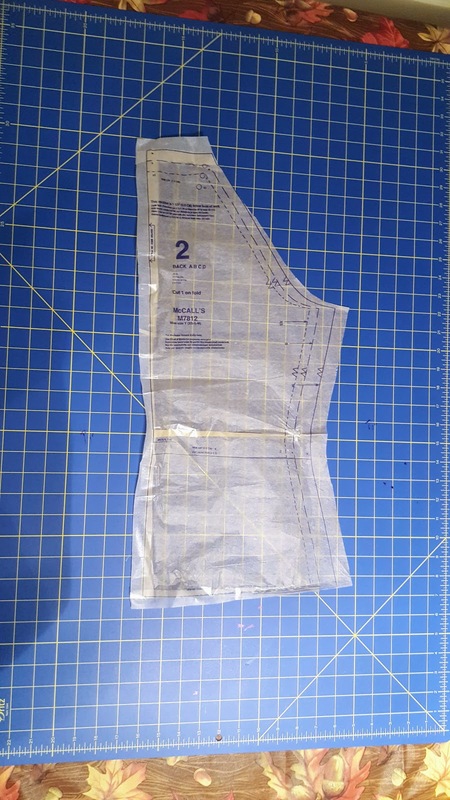 I used size M but cutting it slightly large along the some of the seams. After making the first red top, I identified another issue. The neckline was too low and too wide. So before cutting my second top, I raised the neckline about 3/4 inches on the front, back and sleeve. The second top fits much better. Other changes that I made: instead of purchasing ribbon for the drawstring, I made my own cutting the fabric lengthwise about four feet long and 1" wide. I used the satin foot left toe as a guide for how wide I wanted the string to be. Then I used a loop turner to turn the draw right side out. I used stitch witchery to fuse the hems of the neckline and the lower edge of the top in place. Then sewed them. Great stuff. It makes it so much easier to sew a great hem on knit fabrics. Both fabrics used are from FabricMart Fabrics. The red is a crepe knit with about 40% 4-way stretch. This knit has a very nice weight and was easy to sew. The green/brown knit is lighter and slightly transparent with less stretch in both directions. The stretch of the fabric will definitely affect the fit of the top and how the ruching forms around the body. Both of my choices were fine. I'm very pleased with the results of the second top. But I plan to make another view A with sleeves of view B. I could even go for view C.
For my size and changes the time was well spent on making it fit. I recommend it to other sewists with modifications. It may be a good idea to make a muslin as my red top is my wearable muslin. Okay, that's all for now. 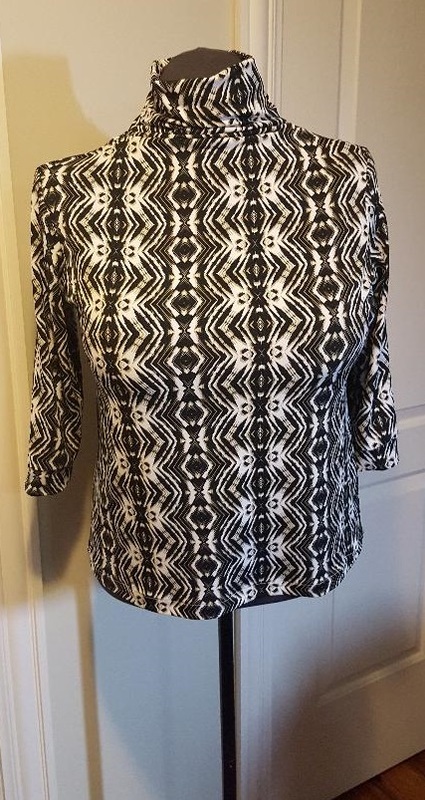 This top is actually the forth garment made in 2019. I'll be posted the rest soon, but I want to get some picture of me wearing them. Anyway, the pattern is "quick sew" T-shirt "like tops. The two differences are: the asymmetric hem and the front pleating. These are the two details that convinced me to purchase the pattern. 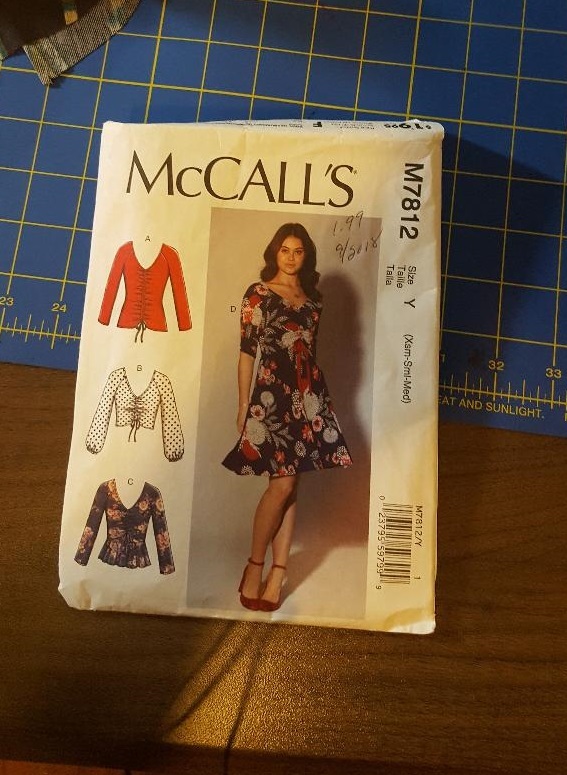 Simplicity describes this pattern as: misses' knit top featuring asymmetrical hems with optional cold-shoulder, contrasting sleeve, 3/4 sleeve, or sleeveless view. I made view D with sleeve from view C. It's comes in multi- XXS to XXL. I used between size M and L with some modifications. My finished top did look like the modeled top, only a more fitted with sleeves. It's winter, for real, in the mid-west. So sleeves are the best optional. The instructions are super easy to follow. The pleating along the center front are just simple tucks with a line of stitches to hold them in place. Nothing complicated about making them. I traced the stitching and pleat lines onto the fabric. Then pinned the pleats in place and stitched. All done in less the two minutes. 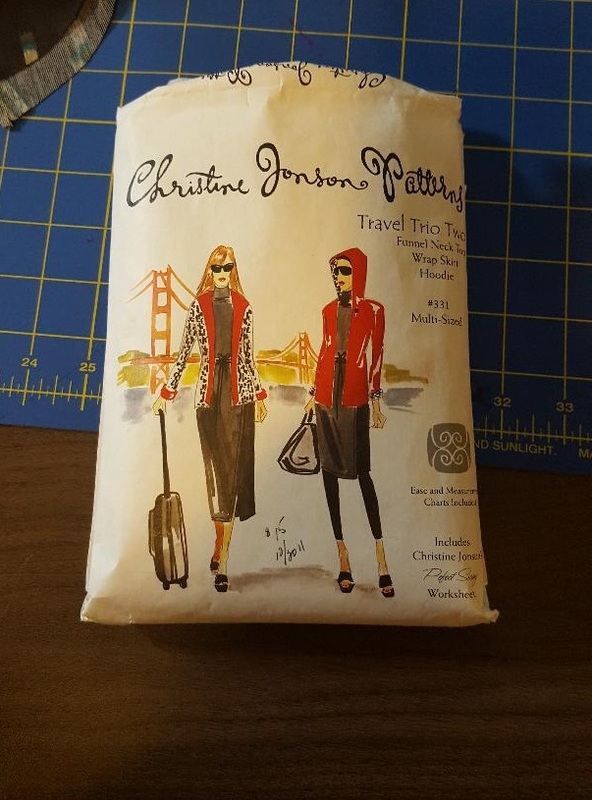 My knit fabric was purchased from Marcy Tilton online fabric store. She really has some great knits. This particular textile is no longer available, but there are other fabulous knits that you can purchase. This knit has 4-way stretch with great recovery. I can't remember the fiber content. Sorry. I only made a few changes. For this top, I skipped my regular FBA just to see if will with work/fit. Instead I cut between M and L at the half way mark on the front armhole and extended the side edges to the large size in the bust area. Then tapered back to between the M and L sizes. For the back, I did do a swayback adjustment and created a center back seam. This works well for me. I forgot to lengthen the sleeves before cutting them out. So I added a 1.5 inch sleeve band to compensate for the shortage. Update - I forgot to add that I shorten the neckband by 2.5" to get it to lay flat. I almost always fail to mention that I use stitch witchery or steam a seam to finish the hem. 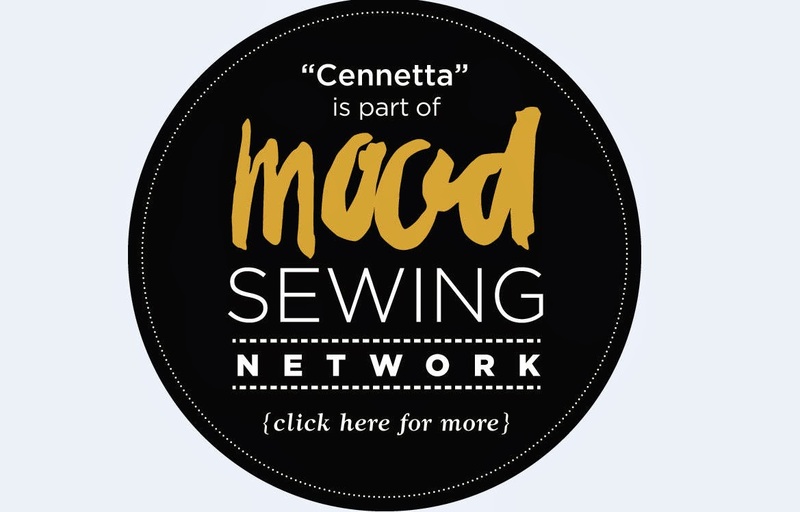 Both of these notions are a must have in my sewing notion drawer. I keep plenty of both on hand. 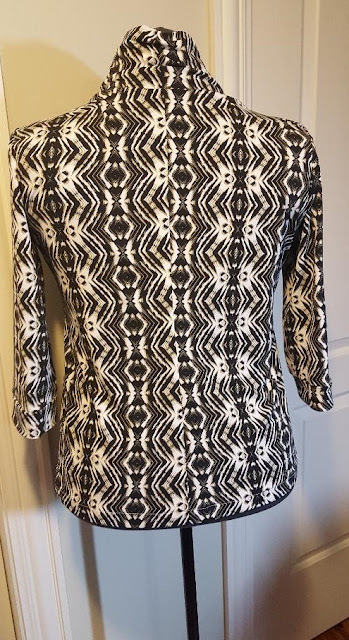 This is a good top to sew to help build your staple wardrobe. I will pair this top with some slim knit pants or leggings. To complete the outfit during these bone chilling days, I'll throw on a cardigan to fight back the cold. I am very pleased with how my top turned out and may use this pattern again. Yes, I also recommend it to others, beginners and advanced sewers. We are already well into the new year. For weeks I've been pondering what's next! Should I write a end of the year review? TOO LATE. Is it too late to post the last few project reviews of 2018? NO. What is a good number of potentially achievable resolutions? A REALISTIC NUMBER. What will I strive for in the new year? IMPROVED SKILLS AND PRODUCTIVITY. How can I make it great? WORKING HARD AT ACHIEVING MY GOALS. Unfortunately, the holiday season is over. I don't miss all the shopping, but I love the happy spirit of comes from people. Everyone seems to smile and laugh more. The sounds of Christmas is every where. There are lots of parties and gatherings. It's a joyous time to celebrate the birth of Christ, reflect on the past year, and make plans for a great new year. There is so much happiness in the air. I love it! Christmas time is my favorite time of year. Last year it was super busy for me. I was blessed to do my usual travelling and socializing. My home was water proofed in the summer. After that, my basement needed to be put back in order, at least the laundry room. The sewing studio is still not quite where I'd like it to be. But, I've begun some serious purging and re-organizing. After the water proofing the flooring and the baseboards were reinstalled. Then I had both rooms repainted. In November, I had a procedure to correct some of my sinus issues. To be exact, the surgeon corrected my deviated spectrum and performed a sinuplasty. So I was recuperated for about three weeks and was still on the mend during the holiday season. Despite the periods of NO SEWING, I did sew quite a lot. Overall, I was happy with about 85% of the things I made in 2018. There were six projects that I did not review or blog about. Only three UFO's, all are summer vacation projects. And there were about eight projects that I only did the pattern adjustments for. coats and jackets with welts pockets and buttonholes. I want to get better at finishing details of coats and jackets like to lining with piping,attaching the lining to the coat, and making beautiful pocket and buttonholes details. tops and shirts with plackets on the sleeve and front. Here again, adding more details to tops and shirts. maximizing the use of patterns that I already own. I am going to do more with TNT's patterns instead of buying more new ones. The goal is to mix, match, and hack TNT's to come up with an entirely new look. So, this is my little sag way into the new year. 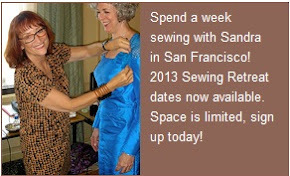 I'm happy to be able to make plans and to share my sewing adventures with all of my followers. 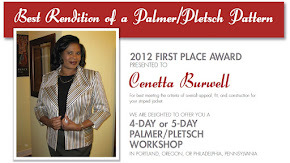 I sincerely appreciate your visits and comments. It's been great. So off to a great beginning and God bless! 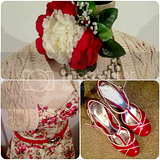 Get The Look……. Pleated Shirt Dress!!! Ann's Fashion Studio ~ "Ann Made Fashions"
Should you Hire an Event Decor Designer? I've Moved to Wordpress! Krystal & Company Crafts! Uhh...Quite possibly my new favorite thing! I simply love to sew and have been since I was 10 year ago. I've been blogging for almost a decade. Now, that I am retired from working in IT/Research Administration, I hope to spend more time sewing and sharing my adventure with the sewing community. Thanks for reading. Stay tuned and don't forget to leave a comment. Copyright- Contents 2007-2010 by The Mahogany Stylist All Rights Reserved. Powered by Blogger.